Finally, a little later morning... Sleeping a little later, we had the buffet breakfast at the hotel. One of the things that Sharon wanted to do on the trip was see Kauai from the air. Sharon reserved a trip with Blue Hawaiian for 11 am. Leaving the hotel about 930 am, we were at the helicopter's office in Lihue about 10:15 am. We got a preflight briefly and were bused to the airport. I enjoyed the trip a great deal. You got to see the island from a new perspective. In a 55 minute tour, we went by the waterfall used in the opening sequences of the first Jurassic Park movie, through the Waimea Canyon, along the Na Pali Coast and finished up inside the crater of the tallest peak on Kauai. While both Sharon and I enjoyed the trip, we both liked the Na Pali Coast cruise more. 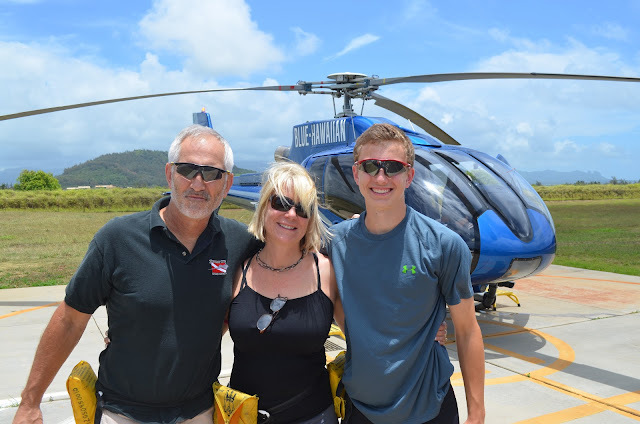 After the helicopter ride, we headed towards the Waimea Canyon. The canyon is 10 miles long and 3,000 feet deep. Sharon drove and we headed up the Waimea Canyon Road. We stopped at a couple of the view points. The views were spectacular. 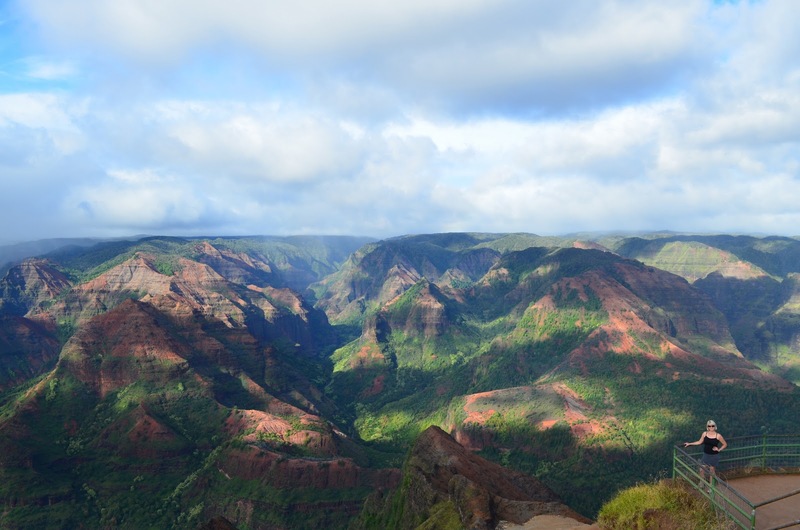 The Waimea Canyon is called the Grand Canyon of Hawaii. When we reached Koke'e State Park, we stopped at the lodge and museum and asked about a short hike. We ended up doing a two mile hike on the Berry Flat Trail. During the hike, we ran into two groups of Hawaiians with dogs that had radio collars. I asked what the collars were for and got an obtuse answer. Later, we heard some gun shots. When we were walking back to the car, the Hawaiians passed us in the truck with a large boar in the back! After we hiked, we continued up the road to the viewpoint where you could see down in the Na Pali Coast. Have I mentioned recently, how much I don't like heights? We finished the night with dinner at Gaylords on the grounds of historic Kilohana Plantation. We had a nice dinner on the verandah. At one point, it started to pour. I had ahi, while Sharon had pork osso boco and Jack had fried chicken. Sharon was not happy by either her or Jack's meal. Treading our way back to the hotel on the north side of the island, it was almost midnight by the time we got to bed. It was a long ambitious day.